This is my second month as part of the Secret Recipe Club, and I was lucky enough to draw Rebecca from A Dusting of Sugar. I thought last month's SRC pairing was perfect for me because of the international connection, but this month worked out great too! Rebecca is a college student, and I work at a college! I love it when the students I work with get into the kitchen, and if they were half as talented at Rebecca, our campus would be constantly wafting with the smell of goodies from the oven. I had a hard time choosing a recipe, so I let my coworkers choose for me. I'd been promising them some baked goods for some time, and this was the perfect opportunity to let them get involved a little with my blog. They voted for three finalists: Banana Streusel Muffins, Flourless Chocolate Cookies, and Peanut Butter Chocolate Chip Banana Muffins. Obviously, the Peanut Butter Chocolate Chip Banana Muffins won, but not without a fight. It turns out that one of my coworkers is a picky eater and had never had banana and peanut butter together! She was a little wary, so I had to promise that I would make her top choice--the flourless chocolate cookies--if she didn't like these. Luckily, they were fabulous and won over my coworker's taste buds. These were perfect for breakfast as well as mid-morning and mid-afternoon snacks at the office. The amount of peanut butter, banana and chocolate chips created a perfect balance of flavor...no one flavor outshone the other. I'll definitely be making these again in the near future! In another bowl, mix the mashed bananas, milk, peanut butter, oil, vanilla and egg. Add the wet ingredients into the flour mixture and stir until just combined. Stir in the chocolate chips. Spray a muffin tin with cooking spray or place liners in the tin and fill each about 3/4 of the way full. This will make roughly 1 1/2 dozen muffins. Bake for 20-25 minutes or until a toothpick comes out clean. MMMMMMM, anything peanut butter owns my heart! LOVE these!! The combined flavors must have been awesome! Such a great idea having your coworkers pick which recipe to make and they were able to enjoy the rewards! It's a win win! Elvis would be swooning over these (as I am)! Personally I'm a big fan of PB and Bananas (especially with Nutella). Just by reading the title of your post, I knew u'd picked a great recipe. I've bookmarked it to try out later! Stopping over from the SRC page, these look wonderful! PB, banana, and chocolate? Such a perfect combination! Glad everyone liked them, too. Good choice from your co-workers! I can never pass by a great muffin. I think it is great that you let your co-workers choose. That is a great idea. Wonderful SRC pick! Great muffins!!! I love peanut butter anything, and these look perfect! You got a great blog pick for SRC. It looks like you picked a wonderful recipe. Those muffins would be great for breakfast tomorrow. Thanks for sharing. Awwww, I am honored by your post! All of your recipes look great. I don't read a lot of blogs that have many recipes for *real food*, so I'm glad I have a new site to reference if I want to make dinner! I love peanut butter. I bet these were great! Three wonderful flavors, it has to be a winner. I'll make these soon. You had me at peanut butter, then at chocolate chip and now at banana! Does it get any better at combining flavors - this recipe could become addictive! 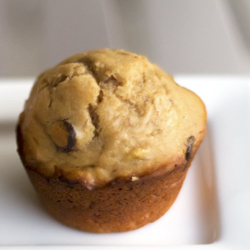 All of my favorite ingredients in one muffin...love it! that is so sweet that you made them for your co-workers!! Very lucky people!!! They look really good!! Lovely choice for SRC . Bananas and PB are an awesome combination. Adding chocolate chips to the mix makes them a KILLER combination. Thanks for sharing! So glad to have found your blog this month. I've always been wary of the peanut butter/banana combo, too but mixing them w/ chocolate makes them easier to accept. This is a great flavor combo. 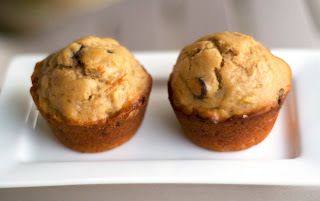 I made PB choc chip banana bread last month and that was a hit except I think they would be better in muffin form like this - I will have to try next time! So I'm making these now for work tomorrow. I really should have done a half recipe I think, and I guess I have a fairly small muffin tin - I'll probably get like 2.5 dozen out of this batch! I did leave out the cinnamon and was happy that my frozen bananas worked well! I did try them and they are pretty tasty! Peel off the paper easy and have a light peanut butter flavor. I like that it doesn't require much oil, I guess because the peanut butter is there. Yum! Thanks for sharing, Mindy!! I have yet to make a peanut butter muffin, but I must and your recipe looks wonderful!!! Amazing! 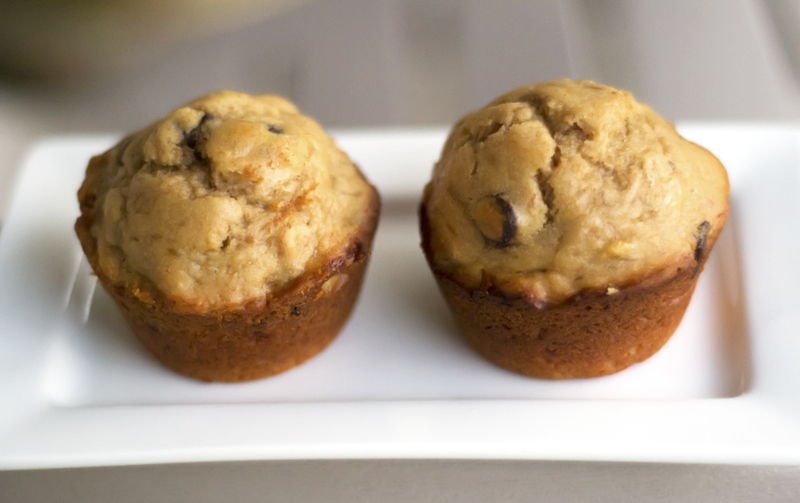 Banana muffins are my favorite, especially with chocolate chips! These are beautiful and they sound SO amazing!! I love the banana peanut butter combo, so I cant wait to get my hands on these!